Overview: Grow your own collection of sparkling crystals.This lab is not for designed to delve into the chemical details of crystal growth. It is created and marketed to demonstrate the basic idea of crystals and how they are formed. It is a kit for younger elementary and junior high level that emulates the growth of real crystals in nature like diamonds and emeralds. Crystals are structures that are formed from a regular repeated pattern of connected atoms or molecules. Crystals grow by a process termed nucleation. Solutes are dissolved into their individual units in a solvent. The solute particles contact each other and connect with each other forming bigger crystals. 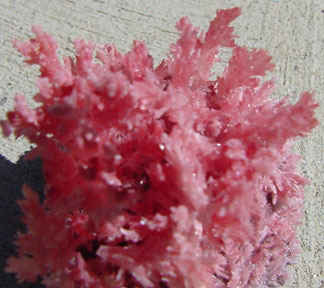 Different salts grow create different size and shape crystals. 2- Select a rock, and place it into the growing vessel. 3- Add the solution, and let it cool down to room temperature. 4- After just few hours the first crystals will stat to grow. 5- Keep the vessel in an undisturbed place, so crystals will continue their growth for several days. 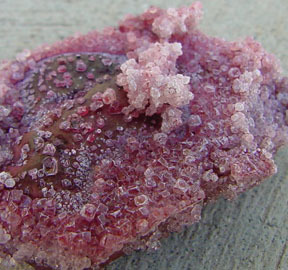 6- Crystals can be removed from the solution after about one week. 1- Why hot water should be used to dissolve the salt? In order to grow a crystal, you need to make a solution which maximizes the chances for the solute particles to come together and form a nucleus, which will grow into your crystal. This mean you will want a concentrated solution with as much solute as you can dissolve(saturated solution) and more solute dissolve in hot water than in cold water. 2- Why a rough rock has to be used to grow the crystals on? Sometimes nucleation can occur simply through the interactions between the solute particles in the solution(called unassisted nucleation), but sometimes it�s better to provide a sort of meeting place for solute particles to aggregate (assisted nucleation). 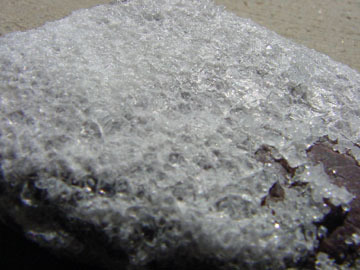 A rough surface tends to be more attractive for nucleation than a smooth surface. 3- How can you keep your treasure crystals? 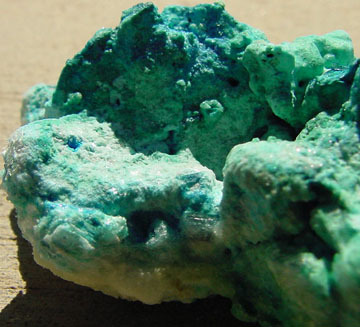 Crystals that were made from a water(aqueous) solution will dissolve somewhat in humid air. Keep your crystal beautiful by storing it in a dry, closed container. You may wish to wrap it in a paper to keep it dry and prevent dust from accumulating on it. 4. How does this simple crystal-formation lab relate to naturally occuring crystal formation we can experience in our world? Many formations found in nature are created from the slow evaporation of water from a highly concentrated solution of different salts, or the precipitation of solids like limestone out of solution as in the case of the Tufa formations in Mono Lake.. Below, click on the links provided to see two formations that will amaze you and allow you to see some real application of this principle in the natural world. This first link is to pictures and explanation of Tufa Formations in Mono Lake. These are limestone towers that form underwater and are visible as the water level in Mono Lake falls. This second set of links are of the Tonto Natural Bridge near Payson, Arizona. It is considered to be the largest travertine bridge in the world. A partial part of the story of its formation has to do with precipitation and crystalization out of a solution. This lab from Carolina Supply is a low-cost simple introductory crystal growing lab. The link below is a great introductory crystal lab for 6-8 grade.